Adorn your living room with the contemporary loveseats that have their own distinct style featuring clean lines and softer edges. Unprecedented in quality with sturdy wood frame and durable upholstery in gorgeous colors, this collection offers you a wide variety of stylish loveseats. Chic in style, neatly tailored and accented with button tufts, the graceful Leda Loveseat will be a perfect addition to your contemporary living room. 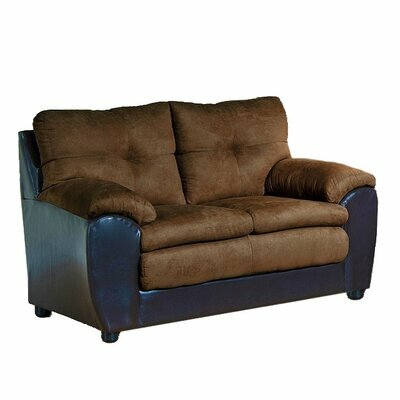 It features polyester upholstery and plush high-density foam cushions for superior comfort while reinforced hardwood frame promises years of reliable use. Further accentuated with crisp welt details, track arms and tapered feet, the clean look and elegance of this loveseat is hard to miss. You can add patterned throws to create a boho-inspired look. Durable and long lasting reinforced hardwood frame. Upholstered in 100% polyester fabric featuring solid print. Upholstery color: Elizabeth Silver / Mali Denim. Back cushions are accented with button tufts. Square arms with welt detailing. Dark brown wooden legs in tapered style. Manufacturer provides one year limited product warranty. 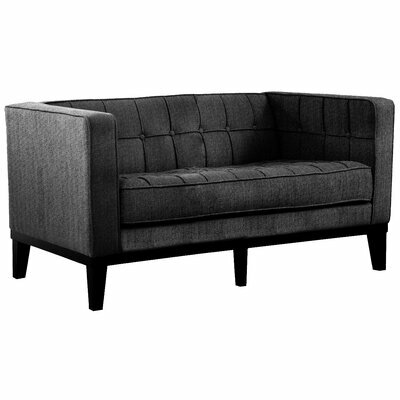 The stylish and cozy Lonnie 61″ Track Arm Loveseat will be a stunning addition to your home. You can place this lovely loveseat in any room of your home, be it you living room or bedroom. Its compact size makes it perfect choice for small rooms, dorms, apartments and other small spaces. It features hardwood frame that lends strength and stability for long lasting durability. Individually wrapped coils are surrounded with poly-fibers and high density foam to provide you comfortable and supportive seating. Gorgeous beige upholstery with crisp cushions, square arms and espresso finished square feet together create a stunningly stylish look that is hard to miss. Thanks to its easily portable one-box packaging, you can navigate it through hallways and doorways like a breeze. Its unique tool-free assembly design allows you to put it together without any trouble and hassle. Lonnie Track Arm Loveseat Collection. Made from reinforced hardwood for unsurpassable strength and durability. Covered in durable and easy-to-clean polyester. Available in more fabric colors including Earth and Gray. Hardwood frame with dense and non-woven ultra-wide strapping ensure sturdy back structure. Individually wrapped coils are surrounded by poly-fibers and high-density foam. Straight arms with welted edges. Square feet in gorgeous espresso finish. This loveseat has maximum weight limit of 500 lbs. Simple and easy tool-free set up allows trouble-free assembly and disassembly. It comes in a compact portable box that makes it easy to move the loveseat up stairs and around corners. Featuring a cozy design and dual-toned upholstery, the elegant yet stylish Brewster Loveseat will be an ideal addition to your living room. Its plush cushions upholstered in soft microfiber create an inviting place to sit and relax while the gorgeous faux leather covers the wooden frame and adds a refined touch. Pillow-top arms give ultimate relaxation when you rest your arms on them. A quality product of USA. Frame of the loveseat is manufactured from durable and sturdy hardwood. Frame is covered in faux leather while the cushions and arms are covered in microfiber. Available in more fabric colors including Black/Pewter and Bulldozer Mocha/San Merino Chocolate. Button tufts on back cushions. Comfy and wide pillow-top arms. It rests on black colored, molded plastic legs. Adorn your contemporary themed living room with the modern-inspired silhouette and stylish look of Ella Loveseat. White faux leather upholstery with button tufting and rich brown block feet add on-trend detailing to this gorgeous loveseat. High-density foam cushions provide comfy seat for you to sit back and relax. 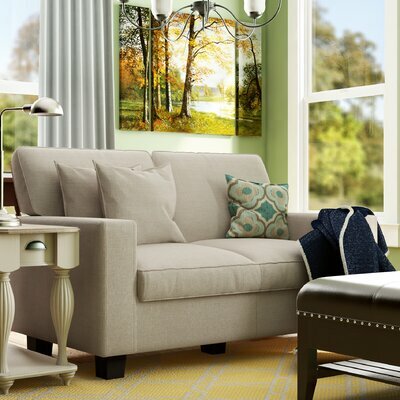 Add colorful throw pillows and create a chic look for a perfect cozy spot in your living room. Kiln-dried construction for long lasting durable. Gorgeous and easy-to-maintain faux leather upholstery. Available in more fabric colors including Gray and Black. Welted cushions with neat tailoring feature crisp shape. T-shaped back cushions add stylish flair. Back cushions are accented with subtle button tufts. Back and seat cushions are not attached. Cushioned with high-density foam for maximum durability. Square arms showcase welt detailing. Add elegance and imperial touch to your home with the stunning and impressive look of Devon Premium Tufted Upholstered Loveseat. Featuring royal purple color, reverse camelback design and crystal-like acrylic button tufts, this loveseat showcases a luxurious and breath-taking style. Thick seat cushion promises ultimate comfort while flared arms add further comfort with majestic style. This picture perfect, timeless beauty includes matching accent pillows with intricate pattern and feathered edges that intensify the sophisticated feel. 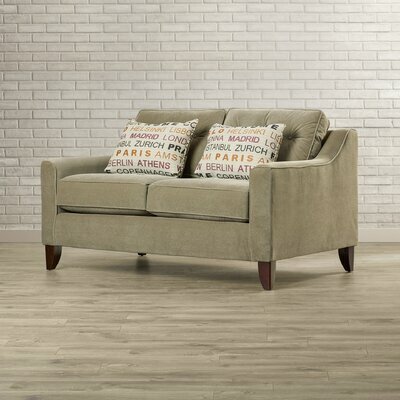 Hardwood frame lends strength and long lasting durability to the loveseat. Available in more fabric colors including Cream White, Yellow, Gray and Light Mocha. 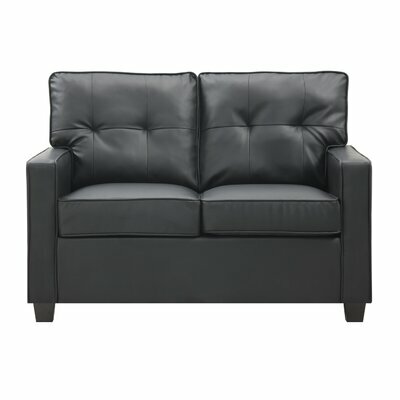 Soft and premium polyester upholstery. Corners are blocked for structural integrity. Includes two accent pillows featuring matching intricate pattern and feathered edges. Seat is padded with plush foam cushion. Reversible and removable seat cushion. Durable and no-sag sinuous spring seating. Embellished with crystal-like acrylic button tufts. Create a perfect cozy spot in your living room with the appealing Delone Loveseat. 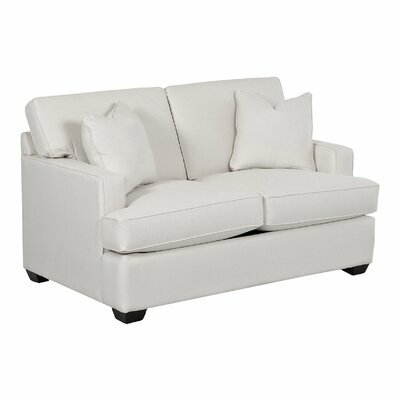 Featuring clean lines with minimalistic style, this versatile loveseat is easy to dress up or down suiting your taste. Suitable for any room of your home, this elegant loveseat promises comfort with reliability. Sturdy and robust wooden frame. Oak colored fabric with solid print. Upholstered in 100% polyester fabric. Pillow back style offers unmatchable comfort. With its stylish look and elegant curves, the Bencomo Loveseat will adorn your living room. It features rising track arms accented with welt that extend to the dark brown tapered legs. This two-on-two welted cushions loveseat promises ultimate comfort. 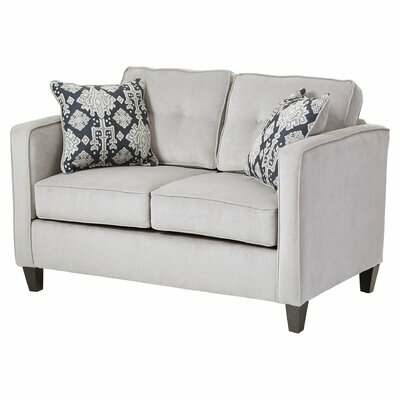 Back cushions have button tufts that add a chic touch to its overall look. Topped with petite rectangular throw pillows featuring multicolor scripted print, this loveseat is sure to become the favorite lounging spot in front of TV. Manufactured in USA from quality wood, metal and durable manufactured wood. Upholstery color: Battleship Lettera Zinc. Available in more fabric colors including Pear Spree Indigo. Durable polyester fabric with simple solid print. Includes gorgeous petite rectangular pillows with stylish scripted print. Sinuous spring seating system offers comfort with durability. Cushions are filled with foam and synthetic fiber. Each back cushion is accented with three button tufts. Dark brown tapered legs support the loveseat. It does not require any assembly. Manufacturer provides lifetime warranty for frame and springs and one year warranty for upholstery and cushions. Enhance the elegance of your contemporary living room with the clean and minimalistic design of Darion Loveseat. Luxurious T-shaped seat cushions ensures you get relaxing comfort when you rest on it after a long day’s work. Featuring sloping recessed arms, espresso finished tapered feet and welted cushions accented with button tufts, this appealing loveseat will be a stunning addition to your home. Frame is crafted from sturdy rubberwood. Available in more fabric colors including Dark Gray, Light Brown and White. Foam filling is CA117 fire retardant. Back cushions are accented with deep button tufts. Cover of the cushions are removable. Loveseat rests on espresso finished tapered feet. This loveseat requires tool-free assembly and it is very easy and simple to assemble. One year limited warranty on placements of parts only. Update the look of your living room with the aesthetically appealing Avery Loveseat. Its elegant and minimalistic design complements beautifully with all kinds of room décor. This lovely loveseat features T-shaped cushions that have high-resiliency foam to provide you a pleasurable seating experience. Crisp welted cushions, mahogany finished block feet and track arms create a spectacular seating spot. Thanks to North Carolina’s one of the best furniture manufacturers, we bring you durable and quality custom upholstery that is produced in USA. Handcrafted in North Carolina, USA. Frame is built from hardwood solids and engineered lumber. Upholstered in durable cotton and twill. This loveseat includes two fluffy pillows in matching color. High-resiliency foam cushions provides comfort with lasting durability. Seat and back cushions are reversible. Both seat and back cushions are removable. Removable cushion covers make washing them easy. Elegant and stylish T-shaped arms. This loveseat does not require any assembly. Create a stunning focal point in your living room with the elegant and stylish Verdi Tufted Loveseat. Synonymous to style, quality and comfort, this loveseat is a visual delight. It is wrapped in premium chenille and accentuated with button tufts with gorgeous welt detailing that add a classy touch to its luxurious look. 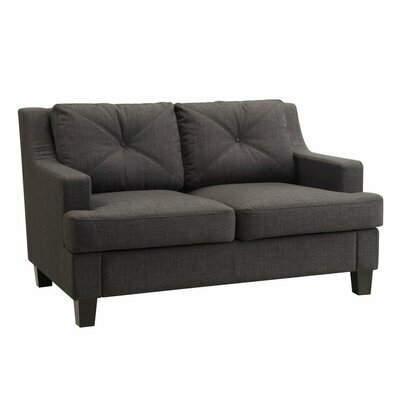 This loveseat does not require any assembly and is ready to use as soon as you receive it. It is available in multiple fabric colors to suit your aesthetic sense and room theme. Upholstered and artistically embellished with button tufts. Solid print adds further to its graceful look. Luxurious chenille upholstery is soft-to-touch. Available in more fabric colors including Cream, Green and Spa Blue. 6 inches thick cushion is very cozy and comfortable to rest on. Welt on cushions and arms lend crispness to its shape. Square arms with welting details. It rests on espresso finished tapered legs. Maximum weight capacity of this loveseat is 600 lbs. One year limited warranty provided by the manufacturer.